Just a few days back, I realized I make repeated recipes with Paneer, so thought to make something different for a change this time… Starter or a side-dish!!! And I came up with a very popular Indo-Chinese variety, “Chilly Paneer”… I love the taste of fresh paneer and hot chillies coated with thick and a little sticky gravy, but I have to have hot chilly sauce replaced by sweet chilly sauce. 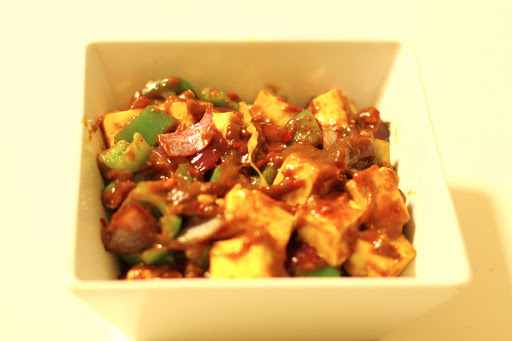 – Cut the paneer, onion, capsicum into cubes and keep aside. – Heat oil in a deep pan and add ginger-garlic paste. Saute it for a while. – Add Spring onion whites (chopped) along with green chillies, capsicum and onion cubes into it and mix well. Cook it for around a min or two, but make sure it remains crunchy. 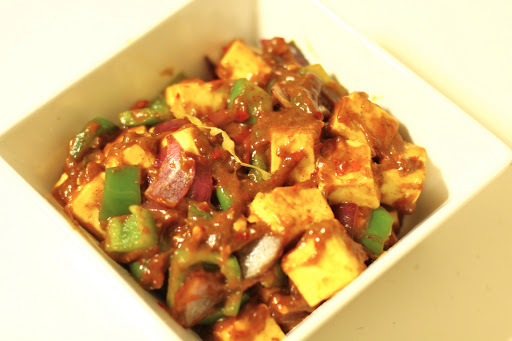 – Add paneer cubes as well as all the condiments and spices. – Make a slurry of cornflour and water in a separate bowl and add it into pan. – Mix everything well, add salt only if required! – Turn off the heat and sprinkle spring onion greens over it. Mix well. – As I said previously, I avoid using Aji-no-moto in any of the chinese dishes. You can use a pinch of it to enhance the flavors. – Soya sauce itself is salty, so be careful when you are adding salt into it. – I prefer sweet chilly sauce over the hot version of it, just ‘coz I can’t have much of spices in food!